From the North: from I-5 take Hwy 20 West at Burlington, follow the signs to Whidbey Island and to Coupeville. From the South: from I-5 take Hwy 525 to Mukilteo. 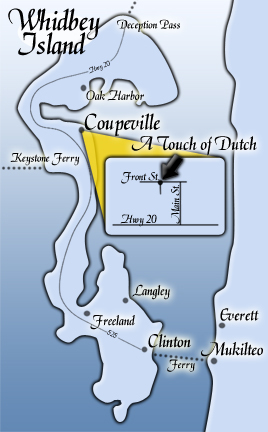 Take the ferry to Clinton onto the island and drive north to Coupeville. From the West: from Port Townsend take the Keystone ferry to Whidbey Island. At Keystone turn left to Coupeville. From the East: This will only work if you come by boat and then you can tie up at the Coupeville Wharf.